Outer Borders - Borders that around the outer edges of the table. 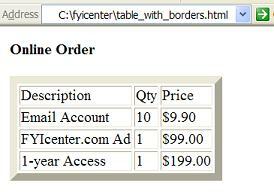 Inner Borders - Borders between table cells. Turning on or off both outer borders and inner borders. Setting the thickness in pixels of outer borders. <table border="8"> - Turns on both outer and inner borders. It also set outer borders to be 8-pixel thick. The inner border will be always 1-pixel thick. <table border="0"> - Turns off both outer and inner borders. <table> - Turns off the borders too, because the default is border="0"